OCB Organic Hemp Rolling Papers are 100% hemp grown and only harvested on organic farms. OCB (Odet Cascadet Bolloré) was created by René Bolloré in 1918. OCB Organic Hemp rolling papers are super thin allowing every smoker to enjoy their favorite smoking products without being overwhelmed by the paper taste you get from other mainstream brands. The gum used for these high quality rolling papers is also made of 100% Natural Arabic, and OCB is both vegetarian and GMO free. OCB Organic Hemp Rolling Papers are sold worldwide, and can be the perfect complement to other 100% natural brands such as our #1 seller, American Spirit. 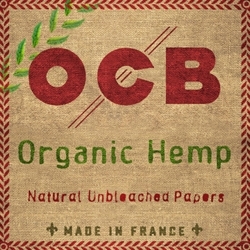 Smoking enthusiasts who love using 100% natural organic smoking products, will enjoy OCB Organic Hemp Rolling Papers. At Smokers Discounts we believe you will too! We’ve made it affordable and easy to buy organic products online. A variety of paper sizes are listed below at our discount online store. Each of these styles are in stock and available. Call us for more details!